Please note that during School Holidays booking office is also open on Mondays. Children prices are applicable for children aged 2 - 14 (Children 2 years and over PAY - Children under 2 DO NOT PAY and can be nursed on the lap. Prams and capsules are stored by ushers and can be collected after the performance. Due to fire regulations,under no circumstances will prams and capsules admitted into the BIG TOP. ALL CHILDREN 14 YEARS OLD AND UNDER MUST BE ACCOMPANIED BY AN ADULT (NO EXCEPTIONS). No Exchanges or Refunds-Please choose your performance carefully. 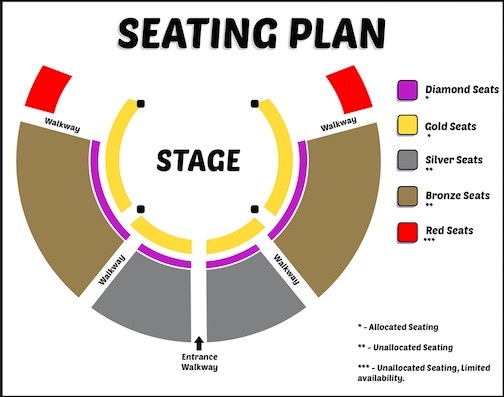 Wheelchair seating is available in the Gold Section, (location dictated by safety requirements) however we do require advance notice to have suitable seating. Bronze Reserve seating only - no further discounts. NO FOOD AND DRINK PURCHASED OUTSIDE THE VENUE IS PERMITTED IN THE BIG TOP! Please note there is a Food and Beverages available onsite at the circus which is open One Hour Prior to each show. Special Exceptions: Baby food and Drink is permitted for Infants.